Douglas’s albinism–fair skin, blue eyes, and blond hair–spared him from arrest in Atlanta and would be adroitly exploited in the future in the cause of civil rights for blacks in the South. In 1962, Douglas married Blanche Y. Gordon, with whom he had two sons and a daughter, and moved to Montgomery, Alabama, to pastor the First Christian Methodist Episcopal (CME) Church. The following year he was elected president of the Montgomery Improvement Association (MIA), an organization founded in 1955 in response to the Montgomery Bus Boycott and first headed by another local cleric, Rev. Martin Luther King, Jr. 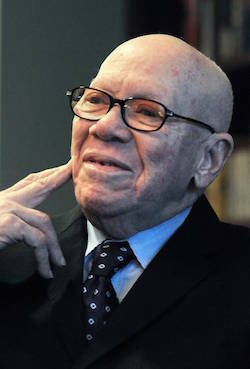 It was during Douglas’s three-year tenure as MIA president (1963 to 1966) that efforts in March 1965 by MIA in conjunction with SCLC to register black voters met with resistance from state officials, unprovoked violence from Alabama state troopers, and deadly attacks on civil rights volunteers. A trusted and reliable ally of King and SCLC, Douglas again proved his value to the civil rights movement through his skillful, behind the scenes coordination of logistics that sustained the 18-day, 54-mile Selma to Montgomery marches. In 1966, Douglas left Montgomery to begin pastoring at CME churches in Birmingham, Alabama; Kansas City, Missouri; Detroit, Michigan; Chicago, Illinois; Flint, Michigan; finally retiring in 2004 at St. Luke’s CME Church in Champaign, Illinois. In 1968 he sang for the occupants of the tent city on the Washington Mall during the Poor People’s Campaign. He acquired his Ph.D. in Black Church Studies at the Colgate Rochester Divinity School in 1975. In 2015, Douglas and his wife resided at a nursing home in Mint Hill, North Carolina.